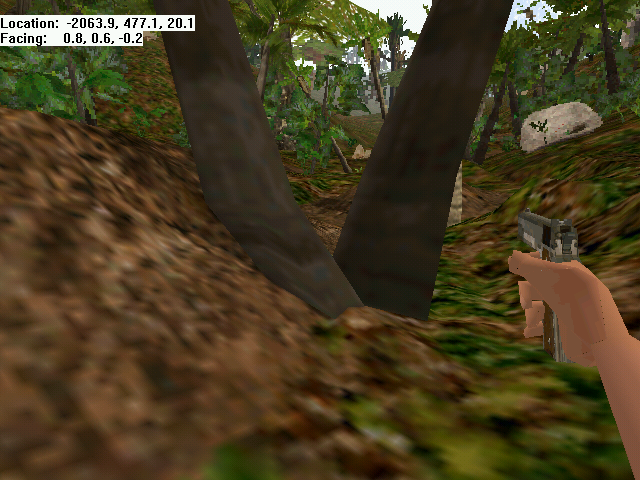 Jungle Road is by far my favorite level in Trespasser. The mysteries surrounding it and the places to go and things to see. 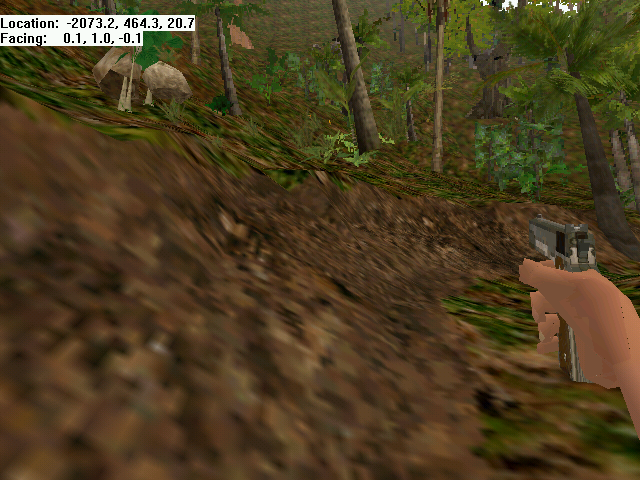 Of course Jungle Road wasn’t always so large. 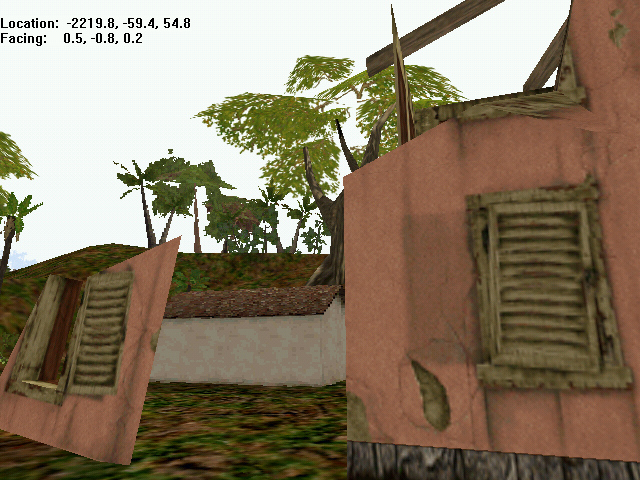 In a prototype before beta 96, it was much smaller and parts of it were in another level known as “Plantation House.” In fact, many of the Plantation house level textures are in the final and beta 96. Mostly in Beta 96. 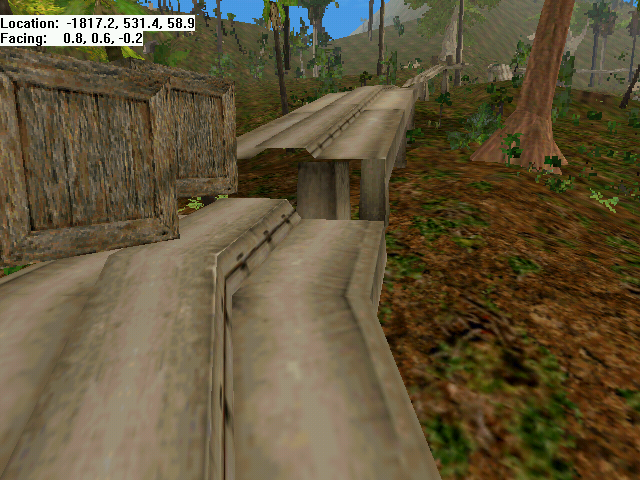 However, Jungle Road originally started at the wooden fence in the Beach level, with the beach ending at the wooden fence. This means the INGEN billboard and everything else after it was in Jungle Road. So it was actually still quite large before being merged with Plantation House. The railroad Terminal also played a role here as well. If you want to know more, contact Tatu about it. He has access to the 1997 walkthrough the developers used to plan out the game. So what was the Plantation House level? Well, orginally, this level would have followed Jungle Road and then been followed up by Industrial Jungle. 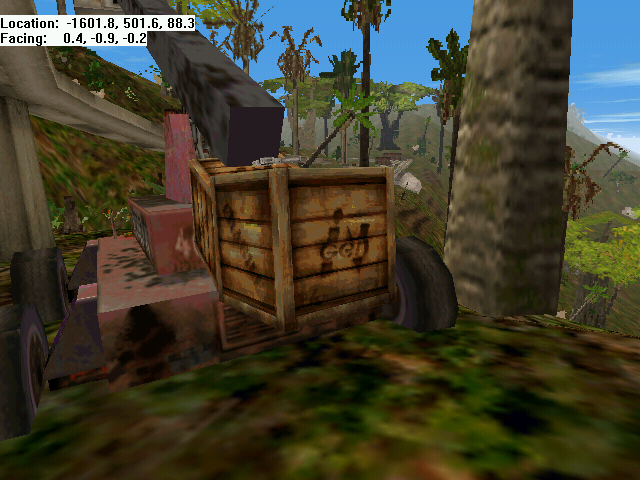 For some reason the level was canned but many of the objects and textures were ported over to Jungle Road. 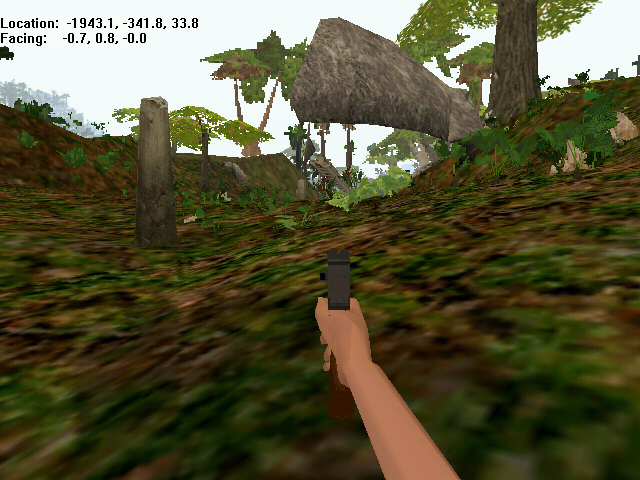 However, some aspects were dropped from Jungle Road. Originally, in Plantation House, Cathy’s beach was to be much larger. 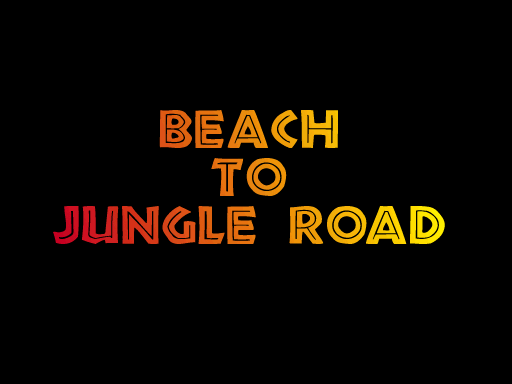 The Beach in Jungle Road was much smaller and serve a different purpose than the final. 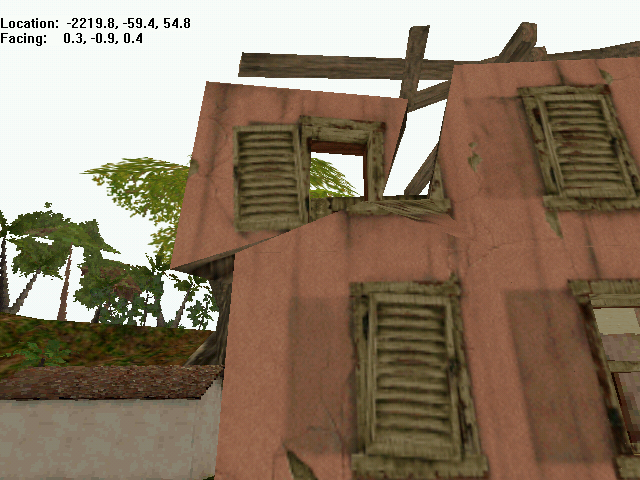 However, with Plantation House scrapped, the Devs put the original beach textures in there though not in build 96. As for the so called “Hidden Valley”. To start off with, we have a very generic looking loading screen for Jungle Road in the beta. Thankfully, it’s just a placeholder. I’m guessing the devs didn’t have the JR level’s loading image ready yet at this point. While this looks like the same model, the pattern on her shirt seems different from the Beach level. As I mentioned in General Differences, Anne has a bad habit of her shirt pattern changing from level to level. This dinosaur tooth here isn’t in the final. However, several strategy guides and walkthroughs mention it. Probably because the tooth was removed very late in production. Almost final version I’d assume. 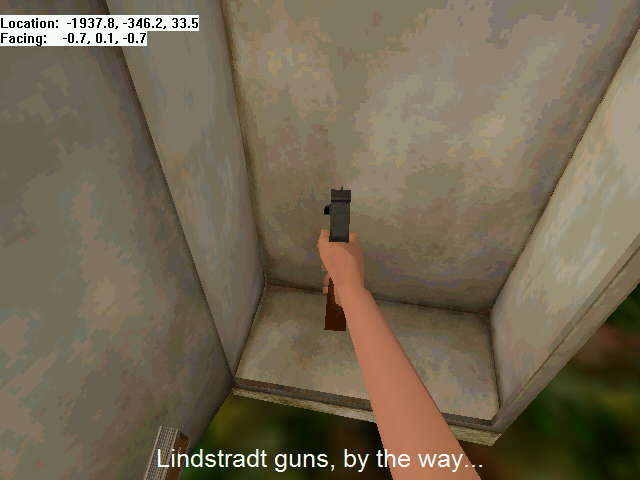 In a weapons cabinet, you’ll find a Lindstradt handgun. This is changed in the final to another weapon. 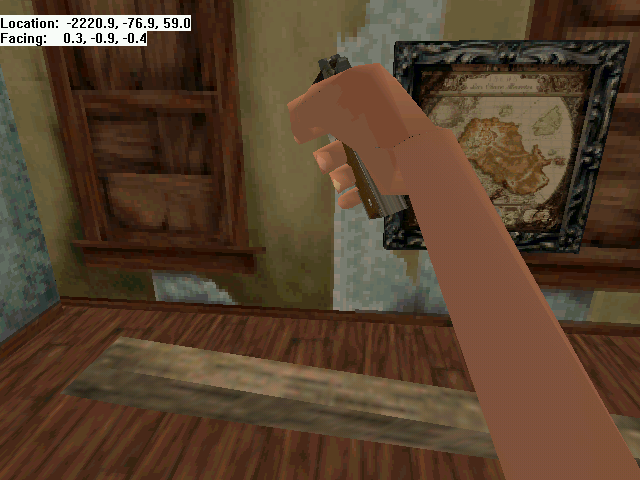 There is a Lindstrat handgun hidden later in the level in the final though, and it is also in the level’s basement in the final as well. Picking up the Lindstradt gun will yield a Hammond voice over not played in the final as far as I know talking about the Lindstradt guns and their origin from Sweden. 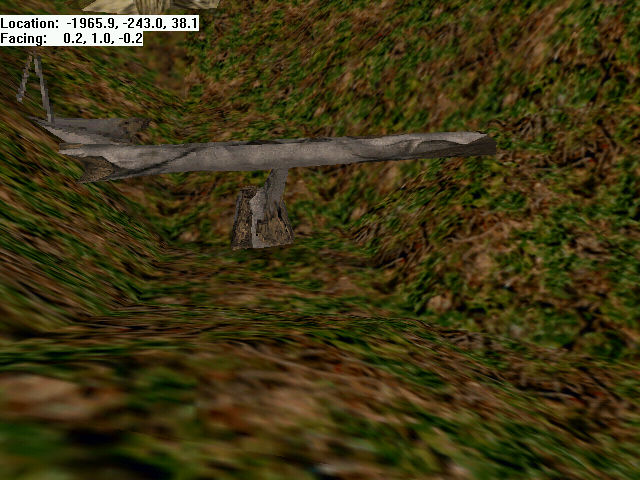 Well, apparently the laws of gravity are broken by this rock. 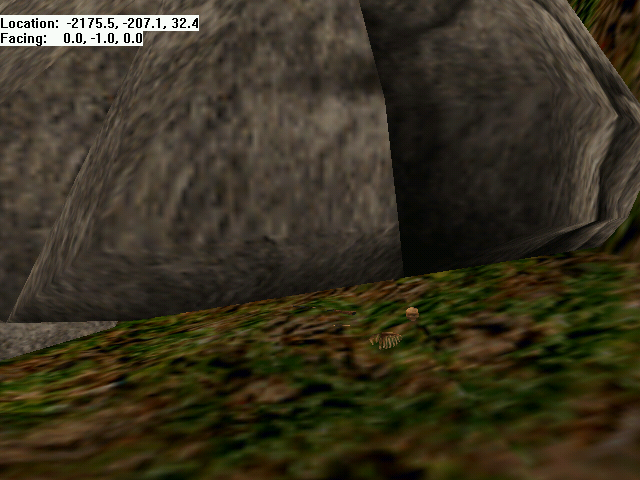 In all seriousness though, it would seem that there was a terrain change at this spot but the rock object wasn’t fixed. These are everywhere in the beta. Especially in later levels and most notably Industrial Jungle. Also, just a heads up. If there’s a video of something I’m talking about, I’ll post a link to it. Were these objects here in the final? I can’t remember. However, it’s unknown if this is the spot. 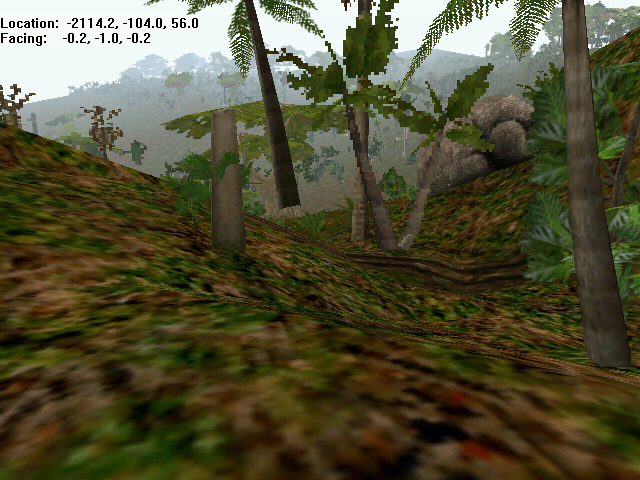 However, it does fit the area described in the 1997 walkthrough due to the crashed Jeep being located nearby. Though, I was hoping pushing the crashed jeep off of the hill would be much more epic if this is indeed the jeep mentioned in the walkthrough. 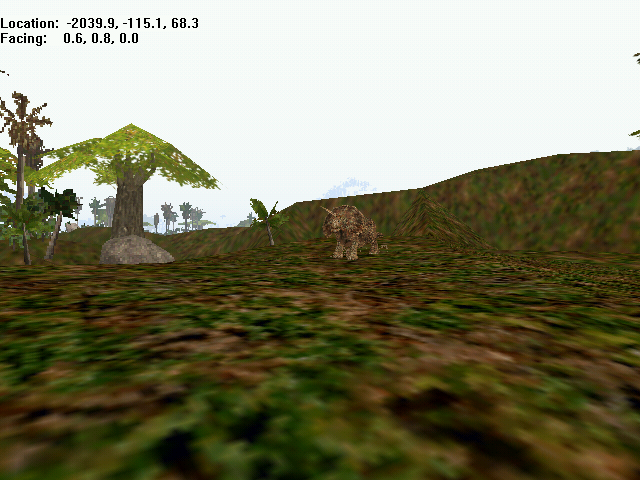 It should be noted that Draconisaurus and Tatu found the texture for the head in Beta 96 JR’s data. 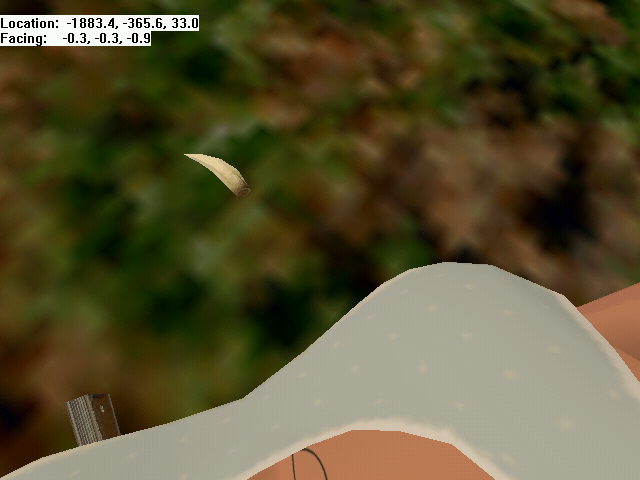 However, it would seem the model for the head had been deleted sometime before Beta 96 as it doesn’t seem to exist. I should also note that Anne says: “You saw what happened didn’t you?” to a cliff. Hinting the head might have been around that spot or so. The voice over trigger is near this skeleton above but a little ways to the left when facing the position in the picture. What I noticed was that the hand in the pre-release image is very different from this one in beta 96 and the one in the final. This means Anne may have gone under more than one face lift during development. The little Shack here has some differences from the final. First off, it has a door. The doors seem a little buggy on these shacks so it can be seen why they were removed in the final. The interior of the Shack is almost identical to the final except for one thing and I’ll get to that in the next image. That Triceratops pointlessly up on that hill in the final is still here in the beta. What bothers me is did this Trike ever have a purpose at some point in development or is he just up there because the development team did it for lulz? We may never know without an earlier beta or asking one of the developers. There was supposed to be a Triceratops alone in an open field but the field description more closely resembles the area where two raptors attack a Trike, which is close to where this one is. There doesn’t seem to be much point climbing the hill. As a side note, the path you start out on goes up here and everywhere else, even in the final, making it look rather strange. A little bit more floating crap. Even more floating crap. What is it with these silly devs and floating things anyway? Lol. The path to the Triceratops fighting the two raptors is easier to walk in. In the final, it is absurdly steep in some places for no really good reason. Welcome to the Plantation House. On the top floor, it’s possible to knock the ceiling rafters down by shooting them. Not all of them though. Just some. 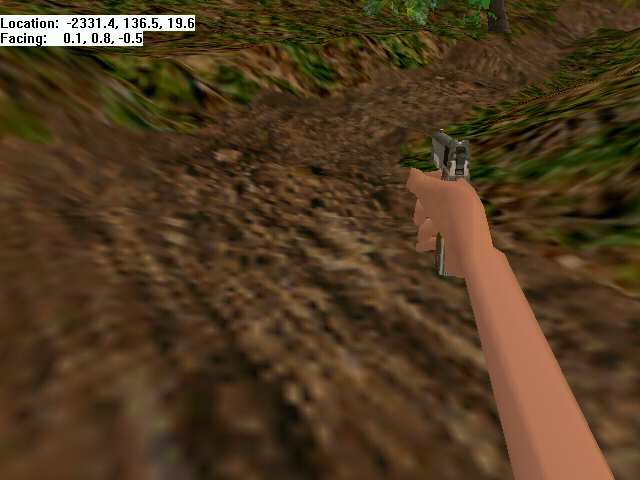 Also, please note that I only have the Springfield .45 with me because I took a trip to the basement of Jungle Road. I’ll get to that in a bit. There is some value discussing it in the beta as there’s a tiny difference in behavior with it from the final. 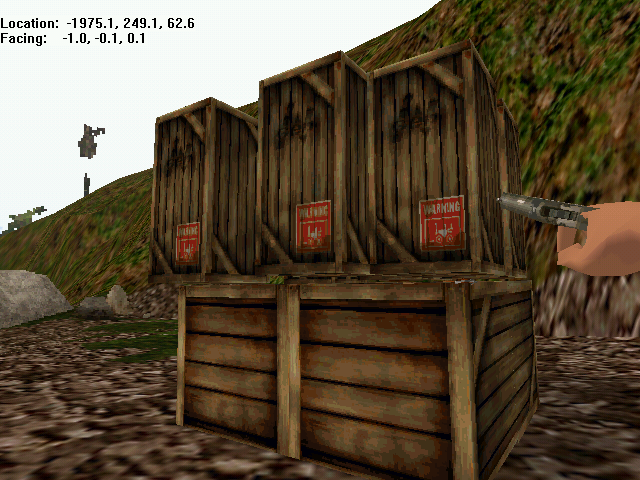 Of course, the Rafters aren’t the only thing you can knock down with your gun as you’ll see. 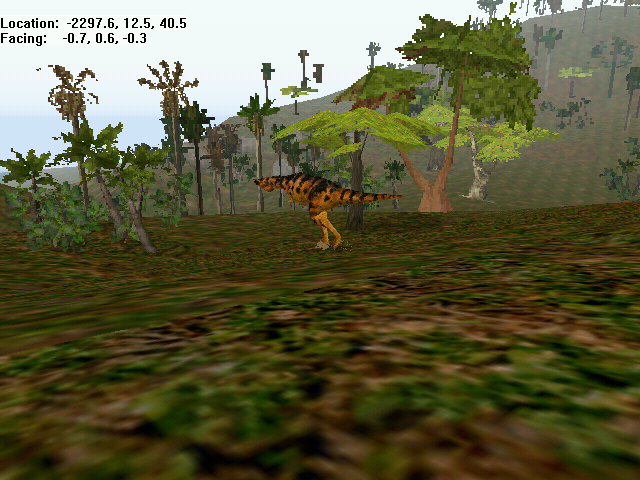 In the 1997 walkthrough, before Plantation House was merged with Jungle Road, an Albertosaurus was planned to attack the plantation house while you were in it and would start destroying parts of it to get to you. This above sort of supports that they had it planned at one point but for whatever reason, scrapped it. Possibly because they didn’t see any reason for it. Another floating rock. At least this one doesn’t have its invisible parts showing. This rock’s behind the Plantation House in the beta iirc not sure where it is in the final or even if this specific rock is still there or not. Also, I should probably note there should be an Allosaurus Skeleton around here in the final. It is not present in the beta. 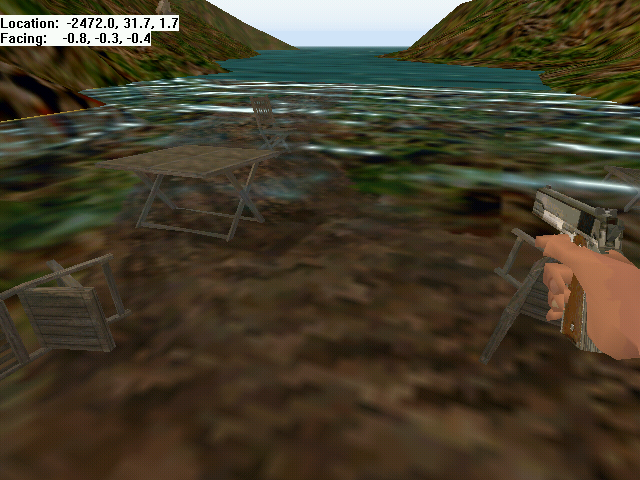 This is what Cathy’s beach looks like in Beta 96. Well, you can’t call it Cathy’s Beach yet as it wasn’t intended to be that originally. You can see though that they’re starting to convert it to Cathy’s beach though due to the presence of the chairs and tables here. Judging by the looks of things, it would seem Plantation House was scrapped in a very recent earlier build and they were starting to merge it with JR. 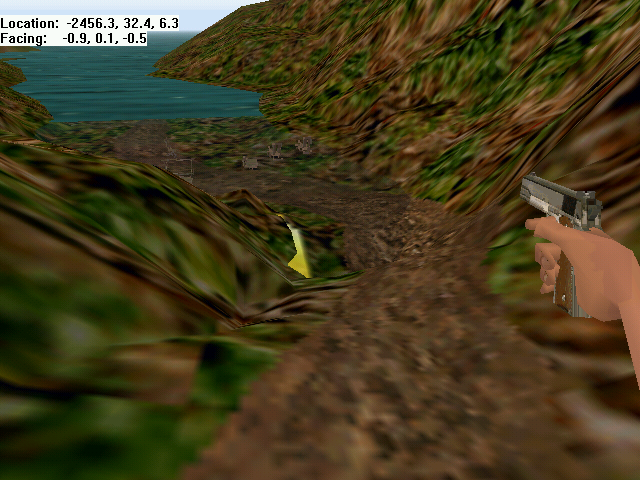 Going by what is said in the 1997 walkthrough, JR’s beach was originally intended to be lonely and foreboding. There was also supposed to be airplane parts from Anne’s plane wash up on the beach. Cathy’s Beach in the plantation house was to be slightly bigger than what we got and like in JR’s final version, The beach was planned to get the player stuck if they fell of the ledge of Cathy’s beach. Unlike the final, this beach can simply be walked up to. Tables and chairs are randomly scattered everywhere. The beach does look a little harsh and lonely, and the chairs, while they weren’t planned for this spot originally, add to that lonely feeling here. However, something about it seems a tad bit off. I think there was stuff removed to make way for the Cathy’s beach things from Plantation House after it was scrapped. This is the path to the hidden valley. 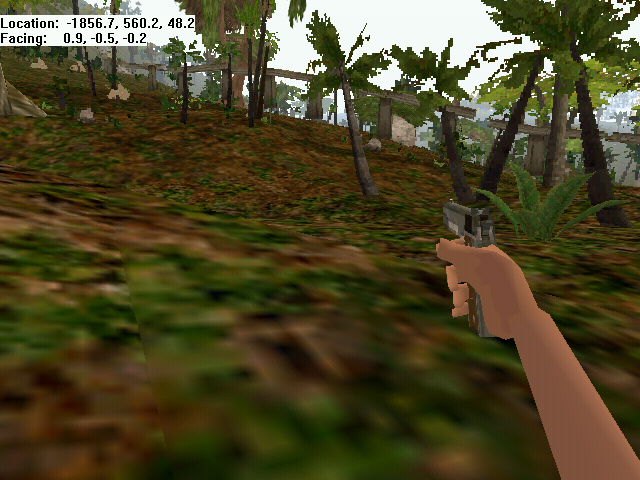 While it doesn’t look much different from the final yet, it will in the next set of screenshots. Before I get to that though, I might as well mention that the Allosaurus Skeleton in the final was located on that hill a little ways in front of me in this screenshot. In the Beta, the Allo skeleton’s not there as I mentioned before. In the Final, right around here or so is another wreaked Ingen Jeep. 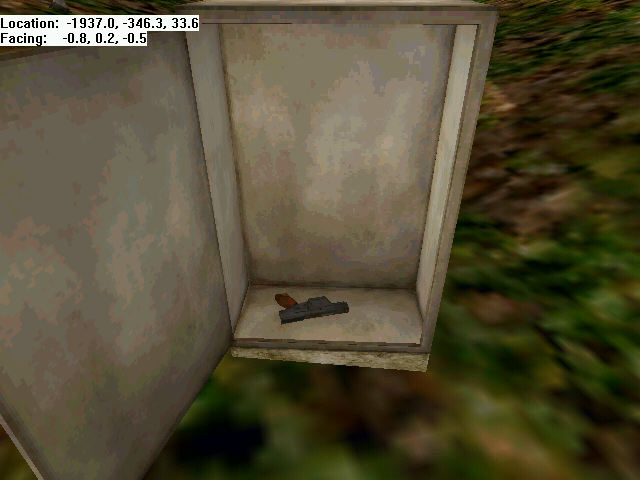 Right next to it on the path is a SPAS Shotgun. Right around here or so in the final, there’s a Triceratops and the path seemingly goes up the cliff. However, you can see that the cliff there in the final is gone now. Why the Hidden Valley was closed off in the final is beyond me. 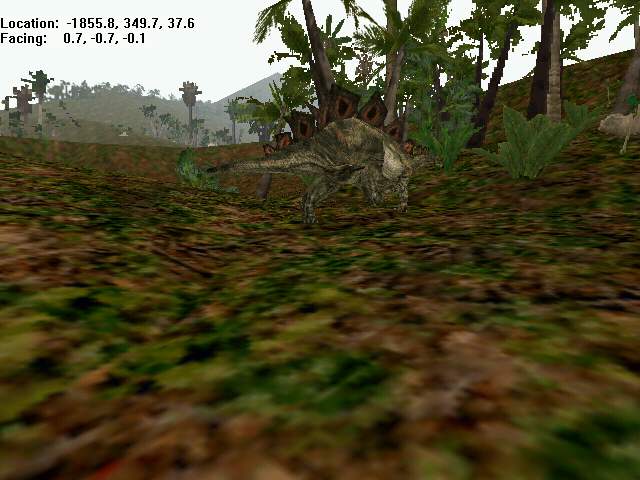 Rumors of the Triceratops stampede were proven false however as this turns out it’s supposed to be a path without any dinosaurs attacking the player according to the 1997 walkthrough. 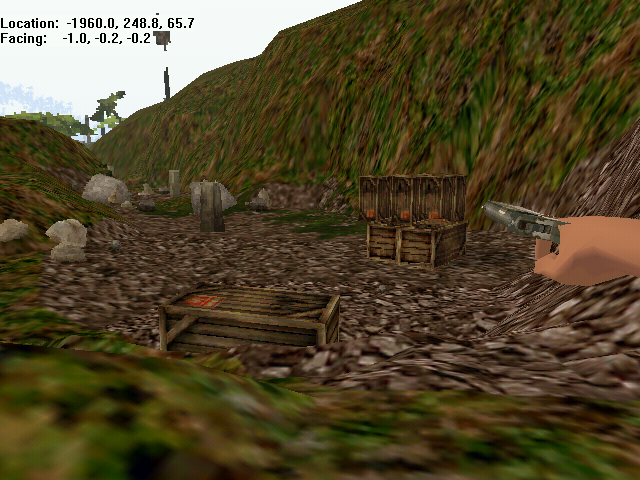 This part of the level also originally came from the scrapped Plantation House stage. In the final, the Hidden Valley is preserved but closed off. There’s even Ambience that plays while in there. However, here it’s easy to tell that sometime between this build and the final they lowered the density of the foliage greatly. In the final, there isn’t nearly as much foliage. Perhaps the amount of foliage was causing speed problems and it was ultimately cut. Also, the idea of traveling down a path without any dinosaurs seems a little boring. Especially if you’re carrying a gun. However, the view here is breathtaking in the beta and well worth traveling at least once if you ever manage to find the beta on the internet. Yeah, even if the rumors of a Triceratops stampede happening here were true, there’s several problems. First of all the dinosaurs AI is mentally retarded, especially the Triceratops. 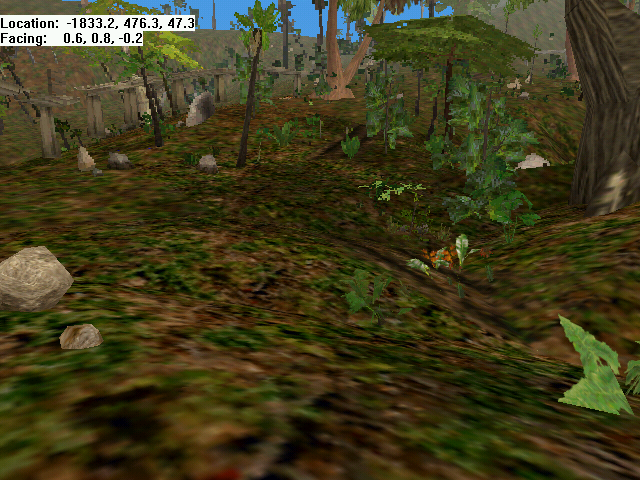 Secondly, there would be too much foliage for a stampede and the Trikes would be stammering around running into crap. 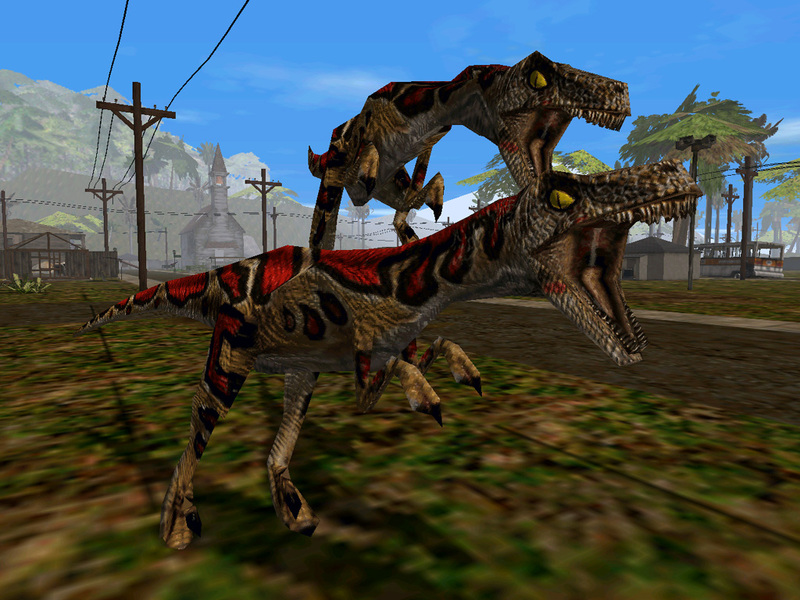 The final reason why a stampede wouldn’t work is that under most cercumstances, the Trespasser engine only supports a maximum of 3 to 4 dinosaurs active at a time. (sometimes 6-8 depending upon how much crap is in a level.) This would cause issues if more than three or four trikes charged at the player. More than just AI freezes, on older computers, the number of active physics boxes at one time would cause slowdown. In fact, it still does on newer ones but they can handle it better. Trikes, being as big as they are would probably cause a crash if more than two were on screen at once on an older computer, or at least slow it down severely. 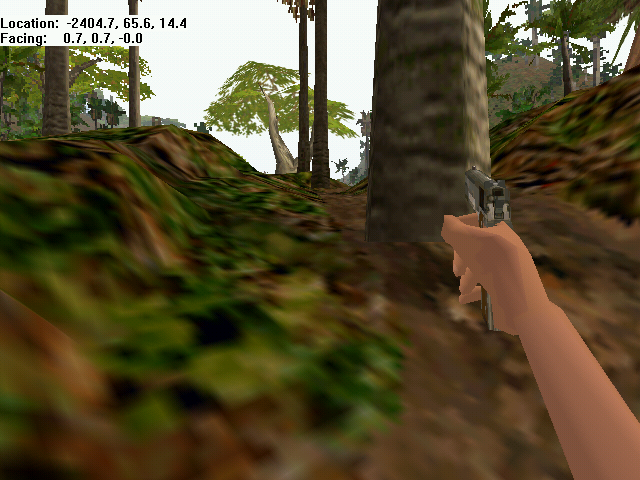 Especially since all the trees are here adding to the likelyhood of a possible Polygon overload which would crash Trespasser if too many Polygons were onscreen at once or Anne turned too fast. The Hidden Valley lasts a good while. Would have been nice if there was something to do other than enjoy the walk in this cut alternate route. The Hidden Valley exits right at the start of the first monorail tracks leading up to the end of the level. Just a little note, watch out for raptors when exiting the valley as a few will be skulking around near the tracks and might come after you. The Hidden Valley exits right at the start of the first monorail tracks leading up to the end of the level. Just a little note, watch out for raptors when exiting the valley as a few will be skulking around near the tracks and might come after you. Nor much to note here. This lift is here in the final and you use it to climb onto the tracks. Why I’m noting it is because the little metal thingy that holds the bucket up is more purple in the beta. In the final it is more of an aqua color. For some of the next few screenshots, I’ll be backtracking a little bit to cover JR’s main route from the Final. 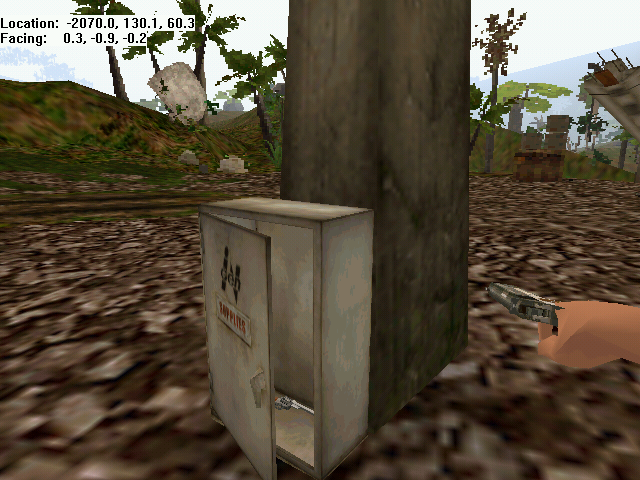 Here in this image is the box puzzle in the final. However, the boxes are a bit more difficult to get. 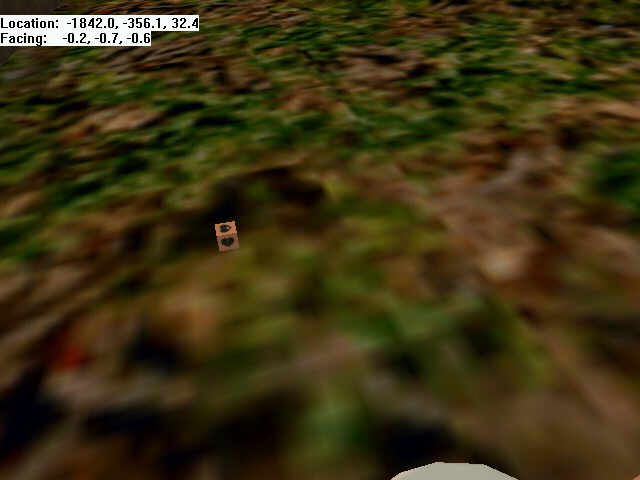 Though nothing else is worth noting other than the ground texture. The two Raptors skulking around this area in the final are here one of them sometimes walks around like it doesn’t give a crap unless you shoot it. Other times, it may attack you. The other one attacks the player upon sight still. 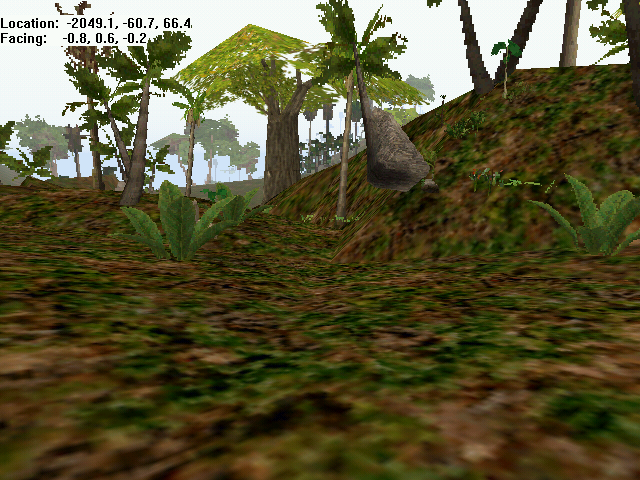 More of the ground textures that were removed from the final version of this area. 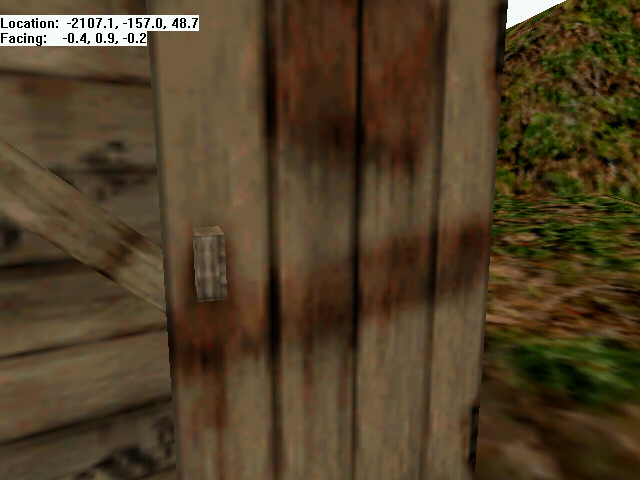 Pretty sweet looking textures too. So sad that they had to be removed for whatever the reason. 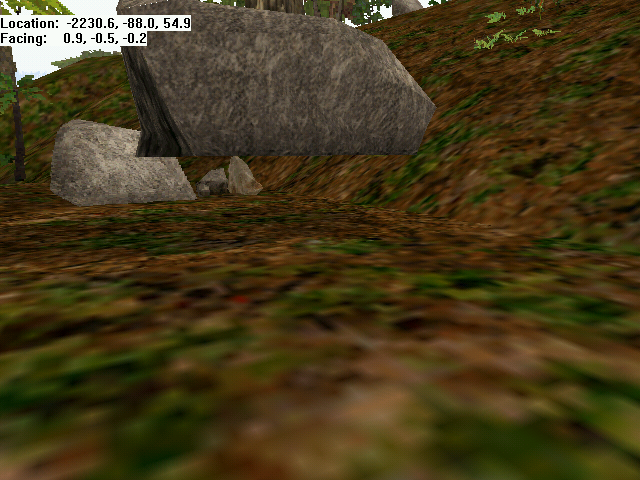 While it may not look much, the ground texture shown in this image is the same. Perhaps this area is an early part of the old Plantation House level. As you can also see, the Green T-Rex, which seemingly seemed to be the dinosaur star of Trespasser during development, is in this photo. This may either be a similar spot, or this very area shown above. Also worth noting is that it looks like the screenshot above was taken in one of the last few prototype builds Mr. Green Rex was in. This is hinted by the fact his skin textures are extremely low res and he looks like a pixelated nightmare. Leaving that area behind, I continue the backtracking journey to the little waterfall to demonstrate Anne’s seemingly messed up floating physics. Anne seems to not be able to float in certain pools of water. The little pond in Pine Valley is one of them and this one is another. 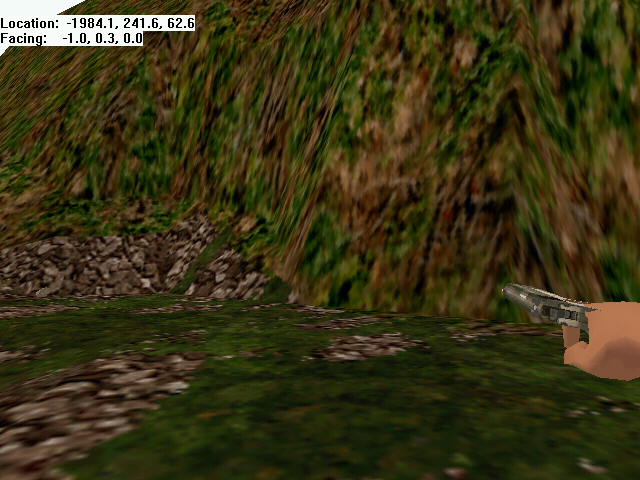 However, it seems to be a problem with her beta model and not the water objects themselves. I’ve ported over her final model to the beta levels before and tested the floating physics in the questionable ponds and final Anne floats on them. Beta Anne is probably missing some code resulting in her walking under certain pools of water. Getting back to the first part of the end of the level I was at before I took my little excursion back towards the little pond above, we see here that instead of a Brachiosaurus, we get a Stegosaurus instead. This fits what is mentioned in certain Trespasser strategy guides. In the guides, the Brachiosaurus isn’t mentioned and instead a Stegosaurus is. I guess they felt like two brachiosaurs weren’t enough and replaced the Stegosaurus here with a Brach to make it seem like there were more than just two Brachs on Site B. Well, not that it’s really a loss. I personally think the Brachiosaurus was a better addition here anyway. Especially since there were so few used in Trespasser’s final version anyway. Also, this Stegosaurus has a bad habit of wondering off. 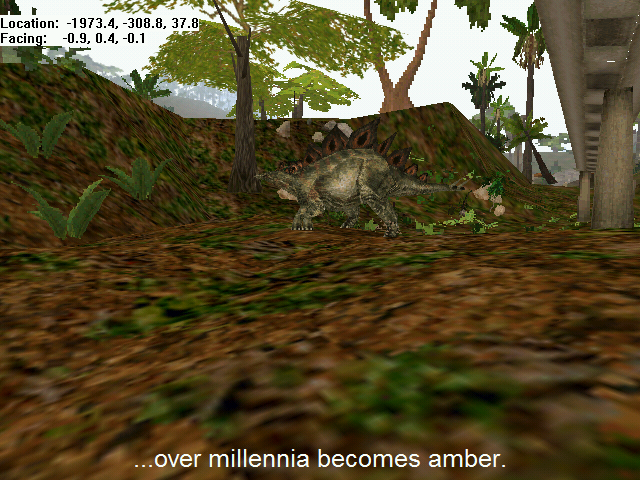 Probably because it’s using the staynear script of the other Stego in the level and is trying to get to that spot. The Barrett seen here in the final or close to this area anyway, isn’t here in the Beta. Not that it’s a major loss. That weapon isn’t very good anyway. 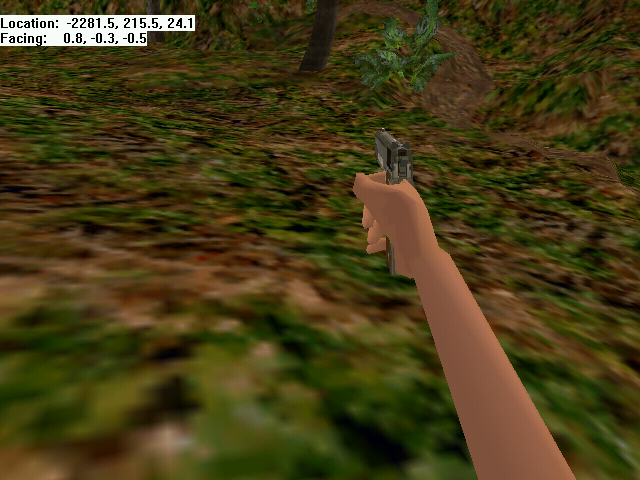 While Powerful, it’s difficult to use due to Anne’s arm bugs. You’re better off porting the custom made version of it from JPDS that allows you to carry it around. Nothing noteworthy here. 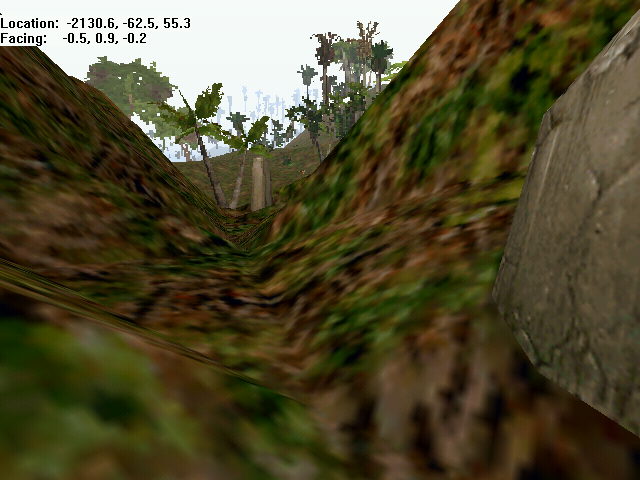 However, it seems that there’s missing textures or something for the monorail tracks here. Aside from floating boxes, the lift is missing some physics blocks on the bottom making it difficult to climb. Also, once again, the lift’s “arm” is purplish instead of the teal/aqua color from the final. 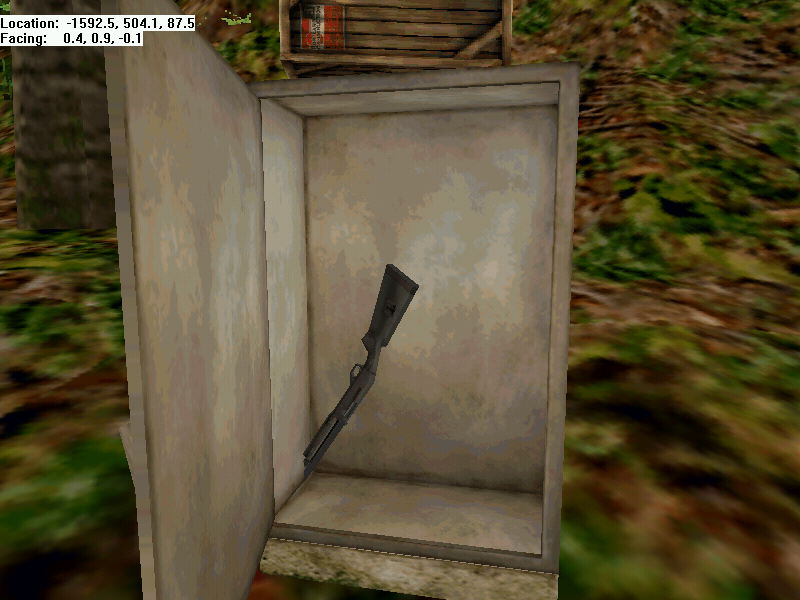 In the final, this Benelli Shotgun is placed on the ground in front of the weapons cabinet. The reason? Well, it’s actually quite obvious in the beta. The damn thing goes all wonky and slides around when you open the cabinet up. As you know, stuff like that can potentially crash Trespasser, especially if you try to grab it. The picture was taken before I could keep it in the original position. By the time I took it, it had moved a little. Hence why it’s clipping through the bottom of the cabinet. 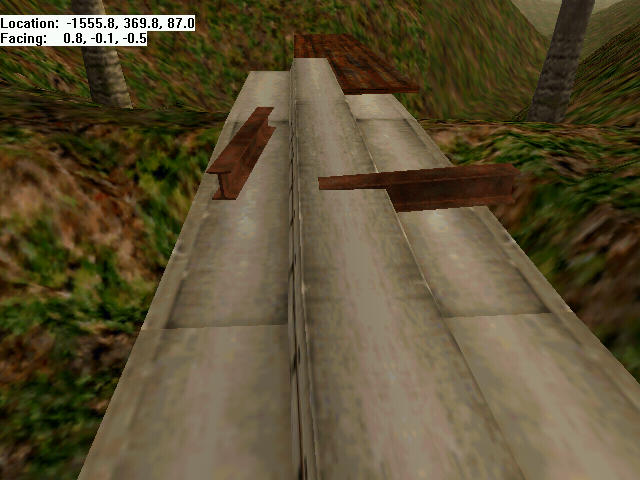 These Steel Girders have no real point here at the end of the level.